Even as western capitalism teeters on the edge of an abyss of debt, tensions between the United States and Iran are increasing… threatening yet another international crisis. I’m pretty convinced that sometime during the next couple of years we will awaken one morning to the news of a “pre-emptive” Israeli strike on Iran. This will almost inevitably drag the United States into yet another war in the region. Which in turn will almost inevitably see British forces (and perhaps some Aussies and others) – even if only a token contingent – killing and dying in Asia once again. What it will do to a global economy already on life-support is anybody’s guess. It’s a grim prospect and one that will – I’m almost certain – have a far worse outcome than either the Iraq or Afghanistan invasions. Israel’s involvement (and I can’t see them not being involved, given the escalating rhetoric on both sides) will make it a lot more messy than it would otherwise be, and Iran won’t be shocked or awed quite so easily as other recent targets of the US military. On top of that, the rise of political Islam (which I suggested would be a likely consequence of the Arab uprisings) is likely to shift the balance of power in the region and exacerbate any conflict; particularly one that involves Israel. As I stressed in a piece on the North African revolutions, my problem with the rise of political Islam is nothing to do with Islam specifically and everything to do with the influence of any religious fundamentalism on the political landscape. From my perspective, given their access to massive military might, Israel (with their increasingly Orthodox approach to both domestic and foreign policy) and America (with the rise of the religious right) are far more worrying than any individual Islamic nation. But the ‘clash of civilisations’ that US neoconservatives appeared to relish so much during the Bush years could finally become a reality should Arabic nations that were once relatively secular (despite being brutal dictatorships) shift towards theocracy during a period of US / Israeli involvement in Iran. It is against this worrying backdrop that one of the most farcical news stories of recent weeks has been playing out. The story began about eight days ago when the US military admitted that it had “lost a drone” over Iran. This alone caused me some degree of consternation. I appreciate that the official US position on Iran is that it’s a rogue state, actively developing Weapons of Mass Destruction, and guilty of destabilising the region. Yet by carrying out military incursions (whether manned or unmanned is surely academic) into Iranian airspace the United States is effectively acting like a rogue state and further destabilising the region. How can it not see this? I guess the big difference is that the US has already developed (and deployed) WMD rather than – allegedly – merely contemplating it. Incidentally, can you imagine the US response if an unmanned Iranian military aircraft had crashed / been brought down while flying over Texas? Seems to me that in this instance, unlike with their decision to send warships through the Suez canal, the Iranians have been a model of restraint. Still, despite the surely criminal actions of the US military (am I wrong in thinking that sending military aircraft into the airspace of a sovereign nation without prior clearance is a crime?) we were assured by defence analyst Loren Thompson that at least the drone would not be offering up any military secrets… “This is a high-flying unmanned aircraft that malfunctioned and then fell to earth. It’s likely to be broken up into hundreds of pieces”, said Loren. 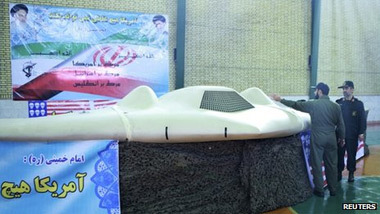 A couple of days later, however, Iranian news media showed images of the drone. Far from being broken up into hundreds of pieces, the unmanned aircraft appeared in pristine condition. Moreover, claimed the Iranians, it didn’t malfunction but was in fact “hijacked” by their electronic-warfare experts who over-rode the control system and landed the drone intact. The United States is scornful of such a suggestion, but frankly the machine doesn’t look like it recently plummeted to the ground from high altitude… so until we have further evidence either way, I’m leaning towards the Iranian version of events. I guess this possibility is giving the US military a bout of the heebie-jeebies… “if they can remotely over-ride our drones”, they’re probably wondering, “then what about our cruise missiles? Even worse!… what about the electronic systems on our manned aircraft? Just how safe are they?” I guess this new development has resulted in a lot of late nights at The Pentagon. People with job titles like “Deputy Assistant to the Director of Electronic Warfare” are producing lengthy reports, risk assessments and flow-charts. I wager that in the executive summary of one such report there appeared a statement along the lines of, “Of course, without access to the captured drone, we may never know precisely how – or even whether – the remote flight system was compromised”. And I suspect it was as result of such a statement that the truly farcical element of this story was born. US Secretary of State Hillary Clinton admitted that she did not think it likely that the drone would be returned. “We are very clearly making known our concerns. We submitted a formal request for the return of our lost equipment, as we would in any situation. Given Iran’s behaviour to date, we do not expect them to reply,” she said. She said that despite numerous “provocations” from Iran, the US would continue to pursue a “diplomatic approach”. I hate to perpetuate a lazy stereotype, but the Americans really don’t understand irony, do they?